Apply for the 6th ARSO Continental Essay Competition on Winning the Fight Against Corruption for Sustainable Africa’s Transformation. See Eligibility, Entry Rules and Regulations, Prizes, Application Guidelines and Deadline for 2018/2019 Session. The Role of Standardisation in winning the fight Against Corruption for sustainable Africa’s Transformation’’ Corruption, Lawal 2007, is now recognized as a global phenomenon, which has to be addressed coherently and consistently and in recent years there have been significant increases in the attention paid to corruption, in part due to (I) series of high level corruption cases in industrialized countries and (2) due to an increasing awareness of the costs of corruption throughout the world and (3) due to the political and economic changes which many countries are undergoing. The Policy Forum - Document on “Corruption and Development in Africa” GCA/PF/N.2/11/1997, goes into details and highlights the negative eﬀects of corruption, viz: “Corrupt practices span a wide spectrum, ranging from petty corruption whereby bribes are required before normal bureaucratic procedures are accomplished, to large scale corruption whereby considerable sums of money are paid in return for preferential treatment or access. Corruption occurs in the political, economic and administrative spheres. Corruption is worse in countries where institutions, such as the legislature and the judiciary are weak, where rule of law and adherence to formal rules are not rigorously observed, where political patronage is standard practice, where the independence and professionalism of the public sector has been eroded and where civil society lacks the means to bring public pressure to bear. Once corruption becomes entrenched, its negative eﬀects multiply. It induces cynicism, because people begin to regard it as the norm. It undermines social values because people find it easier and more lucrative to engage in corruption than to seek legitimate employment. It erodes governmental legitimacy because it hampers the eﬀective delivery of public goods and services. It limits economic growth because it reduces the amount of public resources, discourages private investment and saving and impedes the efcient use of government revenue and development assistance funds”. Transparency International’s (www.transparency.org) defnition of corruption is: “the abuse of entrusted power for private gain”. This can mean not only fnancial gain but also non-fnancial advantages. Khan (1996) defnes corruption as an act which deviates from the formal rules of conduct governing the actions of someone in a position of public authority because of private - regarding - motive such as wealth, power or status. Onigu, 2000, further states that, “Corruption is the perversion of integrity or state of aﬀairs through bribery, favour or moral depravity” ... It takes place when at least two parties have interacted to change the structure or processes of society or the behavior of functionaries in order to produce dishonest, unfaithful or defled situations”…in other words - corruption is a systematic vice in an individual, society or a nation which reﬂects favouritism, nepotism, tribalism, sectionalism, undue enrichment, amassing of wealth, abuse of ofce, power, position and derivation of undue gains and benefts. Ojaide Francis, 2000, adds more to the debate on Corruption and brings into perspective the issues of bribery, smuggling, fraud, illegal payments, money laundering, drug trafcking, falsifcation of documents and records, window dressing, false declaration, evasion, underpayment, deceit, forgery, concealment, aiding and abetting of any kind to the detriment of another person, community, society or nation. The corruption vice, Grace Kobusingye, 2016, comes along with costs as citizens are compelled to pay for services that should be free; state budgets are pillaged by corrupt politicians; public spending is distorted as decisionmakers focus spending on activities likely to yield large bribes like major public works; foreign investment is blocked as businesses are reluctant to invest in uncertain environments and economies suﬀer. She points out that, not only costly in terms of money, it is also costly in terms of public trust and citizens’ willingness to participate in their societies. Corruption often has links to organised crime and fosters, as well as thrives, in conﬂict and war. Indeed, high levels of corruption can increase the likelihood of a protracted conﬂict or a post-conﬂict society sliding back into war. Eﬀorts to tackle climate change can also be undermined by corruption as bribes are paid to ignore environmental protection rules in the pursuit of quick profits. ARSO is an intergovernmental body, established by the African Union and UNECA in 1977 with the principal mandate to harmonize African Standards and conformity assessment procedures in order to reduce Technical Barriers to Trade and therefore promote intra African and international Trade as well as enhance the industrialization of Africa. Part of ARSO mandate is to ensure the well-being and safety of the African Community. Thus being an African organization, all the eﬀorts to eradicate poverty and ensure the youth are enlightened and create a culture of quality among the youth is in line with its vision and mission. To be an excellent standardisation center that promotes trade and industry. To facilitate intra-African and global trade through providing harmonised standards and facilitating their implementation. The Competition aims to have 3 categories of winners: the National, Regional and Continental. In this regard, ARSO is requesting all the National Standards Bodies in Africa to organise the competition at the National level and send out the attached documents (6th Continental Essay Concept Paper and the Registration Form) to the various Universities /Colleges eligible for the competition. The NSB is expected to conduct the competition at National level. This entails sending out the relevant documents to Colleges/ Universities, receiving the essays from the participants, doing the assessment and awarding or giving recognition to the winners as appropriate to the NSB. 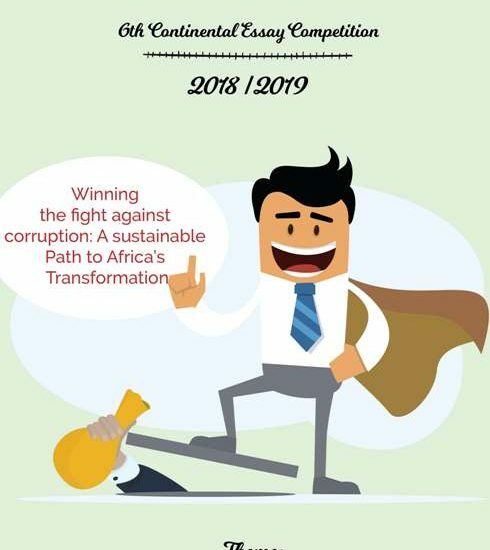 approved by their local commission of higher education) to submit their essays on the theme: “The Role of Standardisation in winning the fght Against Corruption for sustainable Africa’s Transformation” to their respective National Standards Bodies (NSBs) email addresses. (Confrm with your respective NSBs on the submission dates). them to proceed to regional competition. The deadline for submitting top three winners by National Standards Bureaus (NSBs) is 28th March 2019 through essay@arso-oran.org. 4. Language of essays: Essays must be submitted in English or French. 9. Number of essays to submitted: Participants are only allowed to submit one essay. suppliers, Regulators and The government. In addition the winners will be given a trip and accommodation to the next ARSO G.A (ARSO General Assembly) event that will take place in 2019 to be honored. Burundi, Comoros, D.R Congo, Djibouti, Ethiopia, Eritrea, Kenya, Madagascar, Rwanda, Seychelles, Somalia, South Sudan, Tanzania and Uganda. More information on this can be obtained by visiting www.uneca.org. organizers of this event who may publish it in whole or in part on their respective websites, websites of national standards bodies, a wide range of publications for circulation both inside and outside Africa. Winners will be selected through a fair and impartial selection process by the organizers. during the ARSO General Assembly.